Analysis of a June survey from the Pew Research Center for the People & the Press reveals how support for the 2008 presidential candidates varies among some religious groups. Hillary Clinton currently generates the most enthusiasm among Democrats in both religious groups for which sufficient data were available. 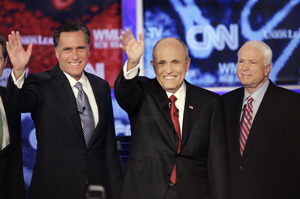 Among Republicans, Rudy Giuliani garners the most support in all three groups. Support for Giuliani — who is Catholic himself — is particularly strong among Republican Catholics, with nearly half (49%) saying there is a “good chance” they would vote for him. Giuliani also has the highest level of support among Republican white evangelicals, though his support among evangelicals is somewhat less than among Republican registered voters overall. To find out more about the 2008 presidential candidates’ views on pressing religious issues, from abortion to gay marriage, visit the Pew Forum’s Religion & Politics ’08 home page.